Doubtless, you will find it useful to have an otoscope available in your home. The best way to practice using your otoscope is with the help of an adult volunteer who has ear canals relatively free of ceruman (ear wax). To see the eardrum, grasp the outer ear. 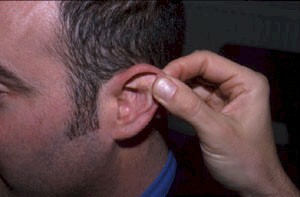 Gently pull backward and slightly upward on the ear (see ear picture below). Most physicians and nurses will tell you the way they learned to do otoscope exams was by practicing on each other back in medical and nursing school. The same holds true in this case. Find some willing adults and start looking into ear canals. Soon you will recognize what is normal. After you mastered the adult exam then you can move on to children and infants. Be patient in the learning process. Included you will also find 3 sizes of specula. It is recommended to begin your exam in adults with the largest diameter specula and move downward in size if needed. In children begin with the smallest diameter specula and move up in size if able. Ready To Purchase an Otoscope? Aussie Otoscope has a full range of Otoscopes for use by Professionals, Students and for those at home. Click below to see our range. You should be aware that it is occasionally impossible to see the eardrum of a small child, or even that of a rare adult, even with the most expensive professional otoscopes. This is because the canal cannot be straightened sufficiently or it is occluded with ceruman (ear wax). Usually, the view that is attainable is a function of ear canal size, and the presence of ceruman build-up. As a physician of many years experience, I assure you that virtually anything can be seen with our otoscopes that can be seen with the $400 wall mounted Welch Allyn model otoscopes that I use at work. IMPORTANT: If you normally where glasses or contacts please leave them on while looking through your otoscope. We have had customers contact us saying that they could not see the eardrum because the instrument focused to close to the end of the specula. 98% of the time these were customers who were nearsighted and they had removed their glasses before looking into the lens of the otoscope. Occasionally we have had an issue with a defective lens. It is also important to not hold the otoscope too far away from your eye when looking into it. If you are having any problem focusing on the eardrum here is a quick and easy way to test to see if the otoscope lens is functioning properly or if the problem is simply user error or an ear canal to difficult to see in to due to earwax, debris, or curvature. This is one of those questions that has two answers....yes and no. The key to doing ear exams is practice. It is important to begin doing otoscope exams on a willing adult as opposed to a child. The ear canals are larger and the eardrum is easier to see in an adult. The key is to look into as many adult ear canals as possible to get a feel for what a normal eardrum looks like. When you visualize an eardrum that is red, has fluid behind it, or is simply abnormal you will quickly recognize this. Ready to Purchase an Otoscope for Use at Home? Click below to see our range of Otoscopes priced for those on the move and those at home. Will Disposable Specula work with the Dr Mom Otoscopes? Using Disposable Specula: The disposable specula fit into the otoscope head, not over the non-disposable speculum that it ships with. The disposable specula fit VERY snugly into place, some people find it easier to put one side in and push the rest of it in next. You may find it easier to do this with the otoscope placed on a table with the hole the specula fits into facing you. 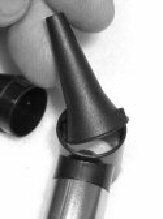 There is a little ridge inside the otoscope head that the disposable specula slide up against when they are in place. READY TO PURCHASE DISPOSABLE SPECULA? 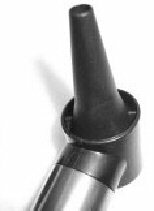 AUSSIE OTOSCOPE CARRIES ADULT AND PAEDIATRIC SPECULA IN SLEEVES OF 50 AT VERY COMPETITIVE PRICES. OUR SPECULA ARE COMPATIBLE WITH ALL OF THE OTOSCOPES ON OUR WEBSITE AND WITH MOST WELCH ALLEN SCOPES. CLICK THE LINK BELOW TO PURCHASE DISPOSABLE SPECULA.